Today, I did a volunteer activity that is a common one in which science faculty participate – serving as a judge for a science fair! I work with many Philadelphia-area middle school and high school teachers through a National Science Foundation (NSF) grant on which I am a co-principal investigator, the Penn State Earth and Space Science Partnership (ESSP). One of the teachers I met a couple of years ago through the ESSP program teaches at Meredith School, a K-8 school in the Queen Village section of Philadelphia. 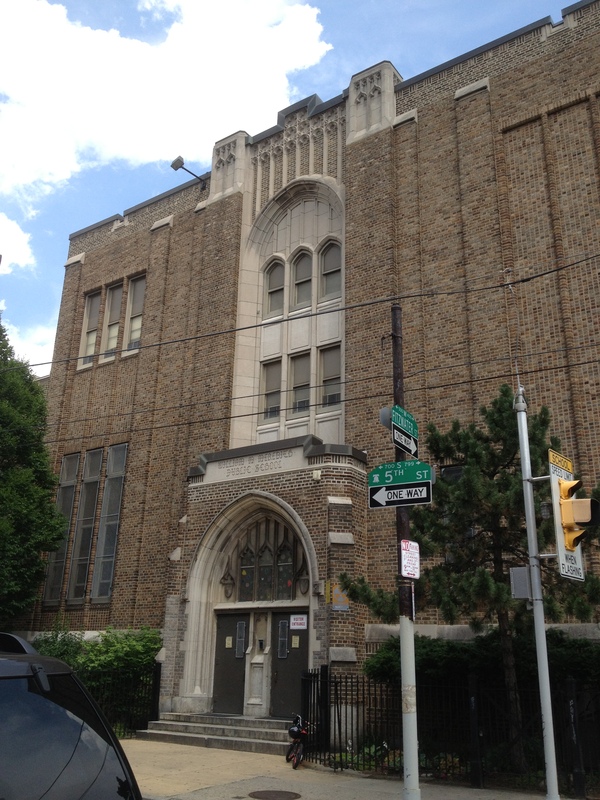 The Meredith School in Philadelphia. Mrs. Joy Bryson is a 6th grade teacher and was in charge of the science fair at her school this year. She needed judges to assist in judging the science fair projects for the 4th through 8th graders, and I absolutely said yes! I’ve judged science fairs and competitions in Philly before, as well as in Colorado and Virginia. It is always so much fun to see how creative the students can be with their work, and as a scientist, I certainly want to encourage students to continue with their passion for inquiry and the pursuit of future science careers. If you are looking for photos of the kids and their 3-fold poster board displays, I’m sorry to disappoint you. As these are children, I did not have parental permission to take and use photos of the minors or of their work. I also do not have permission to use their names. But I can certainly share with you some of what I saw and learned (yes, what “I” learned at the science fair!). The day started with an assembly for the 4th-8th graders by Grand Hank. Maybe my students that grew up in Philly are familiar with him, but I had never heard of Grand Hank before. Born and raised in Philly, Grand Hank had a career as a scientist before he started his multimedia education company that includes everything from live shows to television episodes. Grand Hank also a Guinness World Record holder for running the largest chemistry experiment in the world (who knew? I did not!). With his rap-master DJ keeping the music going and getting the audience dancing (yes, there was some Harlem Shake action), Grand Hank inserted some experiments, math problems and words of encouragement for kids to go to college. I was disappointed that he was not wearing a lab coat for his experiments, especially as the first one involved a flame (he said it was “too hot” to wear a lab coat). This lack of attention to safety is exactly what students should NOT be shown – safety is NOT AN OPTION! Besides this irresponsible comment and lack of demonstrated good judgment, his program seemed to connect well with the kids. I have to admit, the last two science fair projects surprised me. To those students that have done research with me and/or have taken the research methods course I used to teach… this certainly screams “human subject research” and IRB, doesn’t it? At the K-12 level, this work isn’t considered ‘research’ (I’m guessing). Note to self – encourage kids (which I did today) and their teachers to strongly discourage kids from using themselves and family members as test subjects, especially when it involves the consumption of food and pills. This will help the kids when they get to college to know that there are laws to protect research that involves human subjects. And none of the projects were Earth science projects! Note to self – see if I can help teachers have their students pursue projects relating to Earth science. One of the other points that I noticed is that none of the titles on the posters accurately reflected what the projects were about, what they involved or tested, etc. I spend much time with my students on creating meaningful titles to capture the reader and the content of the work. Note to self – think about how to work with teachers (or with PAESTA) to see how we can get students to create better titles. This exercise will help students now and in all of their future work. 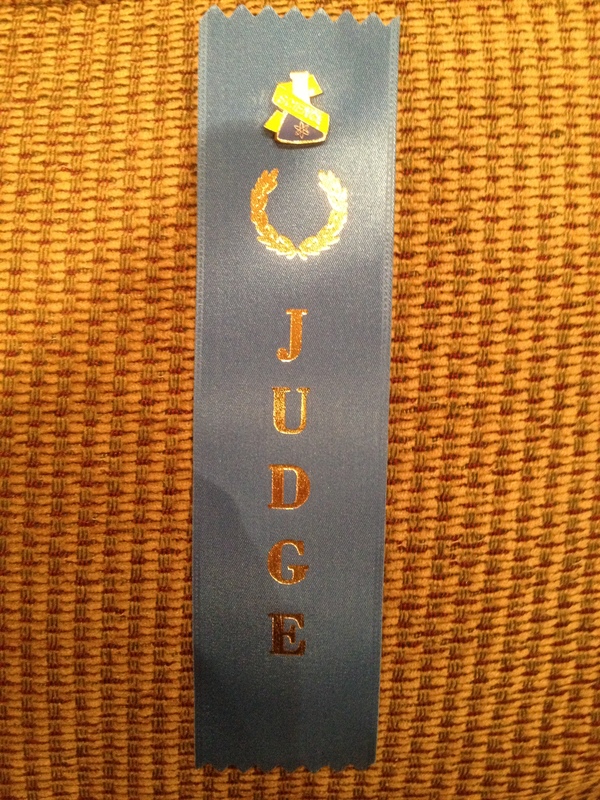 My judging ribbon I wore during the day! I can’t wait to display this in my office – so happy to have helped! Overall, the kids were passionate about their work and well-prepared to describe what they did. There were also some kids that pleasantly surprised me with how much additional research they completed that was not evident on their posters. One of the best moments of the day for me was this group of four 4th graders that were very enthusiastic to share with me their work with electromagnets. Not only did they do a great job explaining their work, they shared with me that they learned how important it is to work as a group. At first, they divided the work into pairs, and found that it wasn’t until they started working together their work was better and got done faster. Good for them, learning more than science! Not all groups were enthusiastic about doing group work, however (sound familiar, current students?). I stayed for some additional science demonstrations and the awards ceremony. I was pleased to see how excited the kids were at being selected as winners and overall how proud they were of their work. I do hope their energy and enthusiasm for science continues. I met several students today that told me they want to be a future doctor, pharmacist, forensic scientist, food scientist… and a couple of students that want to be future baseball players. When I was in elementary and middle school, that last career field I wanted to pursue was to be a scientist – I’m glad I changed my mind about science (thank you, 11th grade chemistry teacher Mrs. DeThomas!). Looking forward to my next opportunity to serve as a science fair judge!